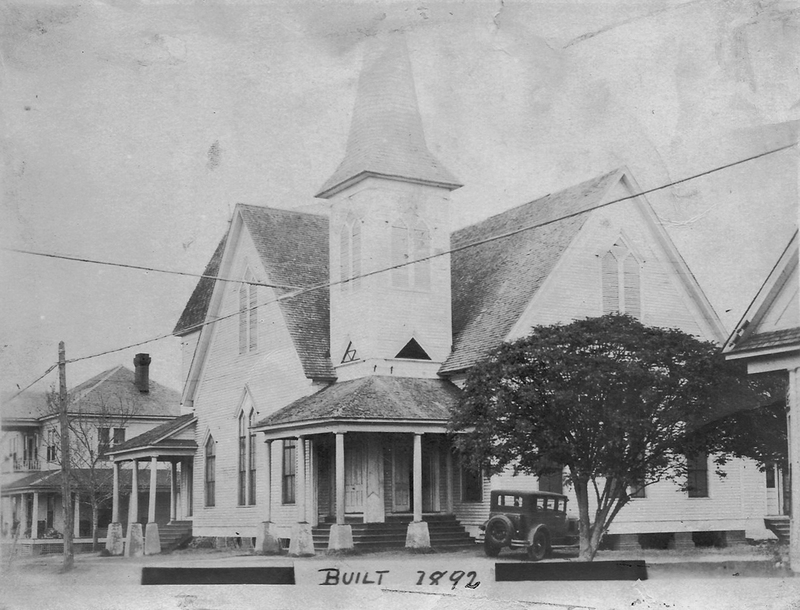 The First United Methodist Church of Center, Texas was organized during the early part of the year 1866. In July 1869, together with the newly chartered Sam Samford Lodge No. 149, the church purchased three acres of land from Judge Martin W. Wheeler. The first church building was two stories; the Masonic Lodge used the second for their meetings and the Methodist congregation used the first floor for worship and Sunday School. The original building was on the North side of the cemetery. For many years, the sanctuary space was divided by a partition wall separating the men from the women. In 1888, a building program was instituted and during the ministry of Rev. C.F. Smith, a frame church building was completed in 1892. At this time, the wall in the sanctuary was removed and this building served the congregation until 1927 when the sanctuary, fellowship hall and education space was erected during the pastorate of the Rev. J. F. Kidd. Between 1903 and 1904, records indicate the first parsonage was constructed, and then in 1939, the parsonage was built next to the church building on Porter Street and Rev. A. D. Lemons and his family was the first occupants. Runnel’s Chapel was added in 1950 while Rev. C. E. Phillips was pastor. During 1954, the entire church structure was repaired, redecorated, and central heat and air conditioning systems were installed to building. In 1954, the J.E. Armstrong residence and grounds adjacent to the church were purchased and the residence converted into the Methodist Youth Center and Church School space for the youth. On May 31, 1961, during a Church and Quarterly Conference meeting, while Rev. Roy L. Felder was pastor, it was decided that new educational space for children, a fellowship hall, would be built. This building plan also called for the remodeling of the fellowship and educational spaces in the present building to meet the needs of the youth and replace the Armstrong building. Mr. W. I. Davis, Jr. was chosen Chairman of the Building Committee. Mr. Wilbert Kent was hired as the architect and Mr. Franklin Pigg as the contractor. On Sunday, July 20, 1964, classes were held in the new classrooms. On September 20, 1964, a consecration service was conducted by Bishop Paul E. Martin, Dr. Neal D. Cannon, District Superintendent and Rev. Walter E. Klingle, pastor. During 1966, Lou Ella Runnels presented the church 2 ½ acres of land adjacent to the present property in memory of her late husband, H. N. Runnels, and two sons. The present-day modern brick parsonage was completed in 1977 on the property donated by Mrs. Runnels. On October 29, 1973, the indebtedness on the Educational Building was paid from a bequest in the will of Lou Ella Runnels . On March 9, 1975, a Parsonage Building Committee was elected at a called session of Charge Conference with the Rev. Alan R. Reed, pastor, and the Rev. Thomas M. Price, District Superintendent. The Parsonage Building Committee continued to work under the direction of Chairperson William G. Ihlo and the Rev. Carleton S. Dyer, pastor. Members of the Maude Adams Church School Class paid for an elevator for the church. Phase I of church renovation plans were completed and the elevator was installed in 1982. 5th Sunday Worship Service & Lunch – Our first 5th Sunday Worship Service with Covered Dish Luncheon & Evening Singing was held with Rev. Keefe Cropper delivering the sermon for our combined worship service. 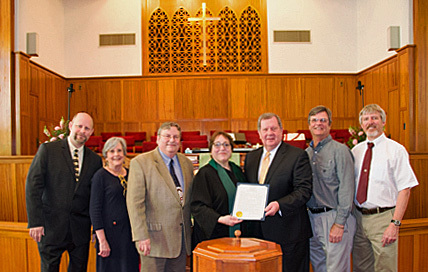 Commemorating our year-long sesquicentennial anniversary milestone “150 Years to Celebrate, 150 Ways to Serve,” the First United Methodist Church (FUMC) of Center welcomed Rev. Carol Clifford Turner on Sunday, April 24 at a combined worship service followed by a covered dish luncheon in the Fellowship Hall. Rev. Carol Clifford Turner is an ordained elder with 37 years of pastoral experience. She is currently serving as Senior Pastor of First Methodist Church in Palestine, Texas. Carol graduated from Center High School, Stephen F. Austin State University, and Southern Methodist University. Since 1979, she has pastored churches in Galveston, Douglassville, Texarkana, New Boston, Maud, Nacogdoches, Longview, Lufkin, and Baytown. Carol has served on many district committees, is active in the Walk to Emmaus, and is involved in numerous community activities relating to child welfare, Habitat for Humanity, shelters for women, medical care ministry, and youth education. Carol began her Christian training in the nursery of our church, was active in Sunday School and MYF, and in November of 1974 was recommended by our church as a candidate for ministry. She was granted her License to Preach by the Nacogdoches District Committee on Ministry on August 30, 1976. Commemorating our year-long sesquicentennial anniversary milestone “150 Years to Celebrate, 150 Ways to Serve” at FUMC Center, Rev. Dr. Wesley Welborn delivered the sermon on Sunday, July 31 at a combined worship service followed with a covered dish luncheon, which included a reenactment celebration of our 100th Anniversary, singing the songs of the time, and recreating our dedication of the “new” Fellowship Hall! R ev. Dr. Wesley Welborn is a Texan, born in Corpus Christi and graduated from Victoria High School. After graduation, he attended McMahon School of Stenotype in Houston. From there, Wesley was appointed Official Court Reporter of the 145th Judicial District Court in Nacogdoches. There he met Becky Lock at the SFA Wesley Foundation. They married in Elkhart in 1970. In 1971, Wesley had a powerful experience of God’s grace and love in Christ Jesus. He prayerfully asked for and received the call to dedicate his life to preaching and teaching about that love and grace. 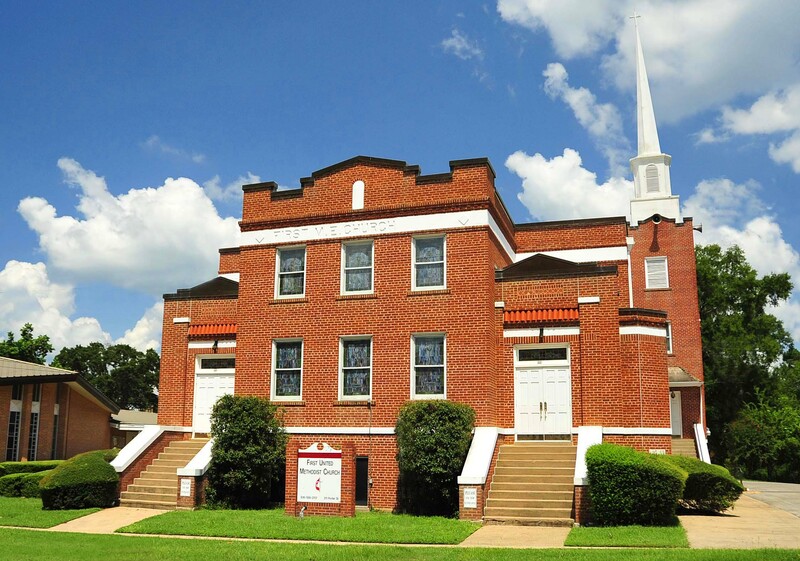 Wesley was appointed pastor of the Smith Chapel Circuit in Mineola on February 1, 1972 and served ten appointments, including Center from 1994 to 2000. In addition to Wesley’s pastoral responsibilities at FUMC Center, he found ways to actively minister to the community through his involvement as a member of the Center Noon Lions Club, the Ministerial Alliance, the Mallory Franks Foundation, and his weekly radio devotionals. After over 44 years of service, he retired at annual conference this year, but will continue to serve the Conference as an Intentional Interim Minister. Wesley and Becky are currently living in Elkhart and have two children and four grandchildren. Rev. 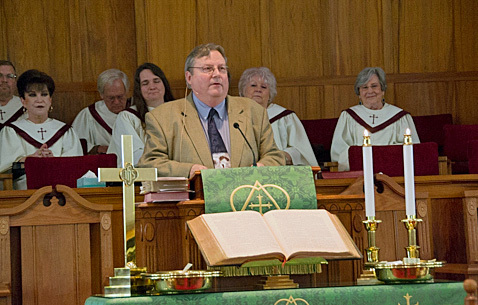 Dr. Jerry Neff has served as a United Methodist Pastor for the past 36 years. He graduated from Center High School in 1973 (his father was pastor of FUMC Center). He graduated from the University of Texas at Arlington with a BA in Political Science, a Masters of Theology from Perkins School of Theology SMU, and a Doctor of Ministry from Perkins School of Theology SMU. He is married to Laura Owens Neff (39 years) and they have three sons, Matthew (37) and wife Alise, Patrick (32), and Andrew (29). Dr. Neff has served in the Texas Annual Conference his entire career. He served at Winona, FUMC LaPorte, FUMC Kirbyville, FUMC Crockett, FUMC Jasper, A&M UMC in College Station, District Superintendent of the North District, and FUMC Conroe. He is presently serving Moody Methodist Church in Galveston. He has served the Annual Conference as Chair of Small Membership Church Committee, District Auditor in three districts, Coordinator of Church Camp for three districts, Vice Chair of the Board of Ordained Ministry, and is presently serving as Chair of the Board of Pensions and Insurance. He is chair of the District Building and Location Committee for the South District, and is a member of the District Leadership Team and a member of the Executive Committee of the District Leadership Committee. He still enjoys golf, living by the beach, and traveling. He is very excited about coming back to Center and renewing old acquaintances and friendships.